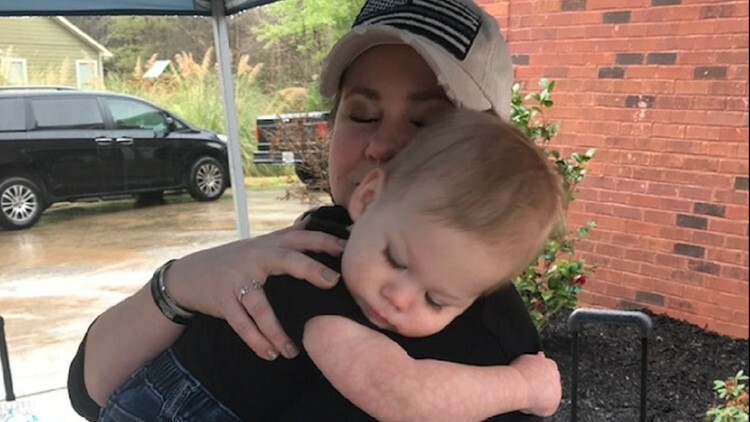 LOCUST GROVE, Ga. — Through the wind and the rain, volunteers worked tirelessly to make life better for the little boy of a fallen hero. Locust Grove Police Officer Chase Maddox was killed in the line of duty in 2018. Since then, so many people have stepped up to help his family. On Friday, the goal was to build a wheelchair accessible ramp for his 8-year-old son, Bradin. Maddox would have built this ramp himself. "He loved so whole-heartedly and unconditionally, and he was just an amazing man," said his widow, Alex. From the determination in her eyes to his badge number on her shoes, Alex Maddox said her husband is always with her. "I don't ever feel a lack of his presence or love and that's what he would want," she said. Their oldest son Bradin uses a wheelchair and Alex said Chase would have done anything to make life better for their son. "Every single day, he would make sure Bradin was a shining light every day," she said. "He was his biggest champion." Now, the community is stepping up to champion Bradin and the Maddox family. Alex has been carrying Bradin up and down the stairs of their home for the past few years. Southern Crescent Habitat for Humanity teamed up with Home Depot to build the ramp for Bradin and support Alex any way they could. All day, Alex stood in the rain telling them what it would have meant to Chase. "He could make anything into a good situation. If you were having a bad day, he was guaranteed to give you a smile," she said. "He was just funny and he was full of life. And if you encountered Chase Maddox, you never forgot Chase Maddox." Home Depot assistant manager Jason Chappell said everyone on his team was on board to help the family. "They've just done so much for us. Anything we can do to help. We all really want to be here." Alex and her family have actually helped build homes for other families through Southern Crescent Habitat for Humanity, so spokesperson Elizabeth Duncan said everyone wanted to come help them in their time of need. "Chase was here one day and just gone the next," she said. "So we really are here to support them in whatever way they need. We will be here"
Alex said this ramp is built in honor of Chase - just another way they can remember their fallen hero. "I had to promise Bradin, our oldest, that we would tell Chase stories, and every day we do," Alex said. "We talk about not only the hero that he was and what he meant to everybody but what he was in our home. He was our leader."